This time of year, one of my favorite activities is to watch the birds outside the window. I sit indoors, warm and cozy, while they fly and dive about the various feeders we have stocked for them. We see many types of birds that never venture this close to our house during the warmer months. The normally shy woodpeckers are frequent visitors as are the nuthatches simply because we provide what the birds are looking for. Whether for pleasure or for educational purposes, it is easy to bring birds to your backyard or balcony by providing their three winter needs. No matter the time of year, birds are looking for three basic things: food, water, and shelter. Sounds easy enough, right? It is, as long as you know what birds are in your area and what their preferences are. During winter months in cold climates, the birds in your area are mostly seed-eaters. Black-oil sunflower seeds and millet are quality seeds that birds prefer. Don’t be tempted to get any old seed because they can be picky-eaters, literally. They pick out the good parts and leave the rest usually in a mess beneath the feeder. In addition to seeds, birds need fat; suet and raw peanuts are great sources. You can buy feeders or make feeders. Making them does not need to be fancy; used milk jugs work well. You can also make the seed mixture and suet cakes as well. These are projects even the youngest learner can take part in. If you are making suet cakes, you may want a recipe to guide you. 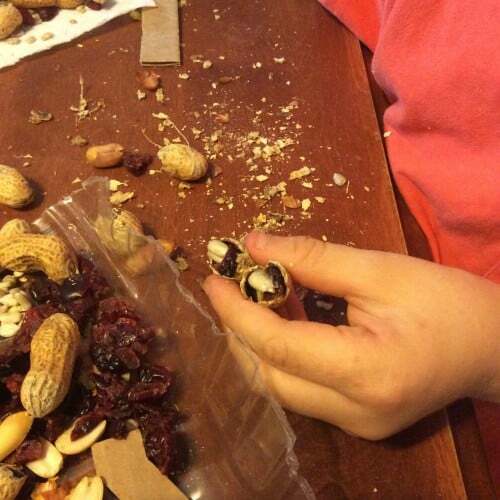 My younger children had a ball stuffing craisins and sunflower seeds into empty peanut shell halves. This was something they came up with all on their own. And the birds loved them. Once you determine what will work best for your feathered friends, be sure to keep those feeders full. During especially cold weather, we refill daily. Birds may have a feather coat, but they also need to consume enough calories to maintain their temperature. When providing water for birds, something open works best since birds not only drink water but bathe in it as well. This is easy enough during warmer months, but what about during the winter? Traditional bird baths easily freeze unless a device is used to keep the water warm enough. We have a large livestock waterer that we keep heated throughout the winter. The primary reason is for watering our flock of chickens, but the smaller, wild birds are regular users as well. If you do not have means to keep the water warm, you will want to replace or rotate the container often. Many people with frequent backyard winter visitors do not include water in their offerings. I don’t think that you will attract birds only if you set out both food and water for them. God has been providing for birds’ needs much longer than we have enjoyed watching them, so they may not need us to set out water. If you do make winter water available, try to continue as the birds may come to depend on it. During the winter months, a bird’s needs for shelter and protection are more basic than if they were looking to build a nest and raise young. Many birds find shelter from wintry weather in nearby evergreens. We have both cedar and spruce trees in our front yard and they can be quite full and noisy during the winter. No evergreens growing nearby? Other dense bushes or thickets are favored as well. You may consider keeping natural evergreen boughs or wreaths from holiday decor to provide additional shelter. Other birds may benefit from repurposing nest boxes. If you have nest boxes that are used during the spring and summer months, you can easily make them into winter homes as well. Besides the normal cleaning and sealing holes, you will want to place the boxes in the best locations. The opening should be away from the wind’s primary direction and where it will get the most sunshine. This may or may not be the same place it is during the rest of the year. You can choose to be simple or elaborate in your offerings and preparations for the birds. They will thank you for your efforts by visiting often and showing off their plumage. What a fun way to do nature study, science, math and even art right from the window. Be sure to keep a bird book (or app) handy for identification. You can participate in the Great Backyard Bird Count February 12 – 16, 2016 or Project Feeder Watch, ongoing through April 8, 2016. Hillary is a homeschooling homesteading mama of 6. She blogs about their mostly Charlotte Mason-style homeschool days at Walking Fruitfully. You can also find her on Facebook, Twitter, Instagram, and Pinterest.